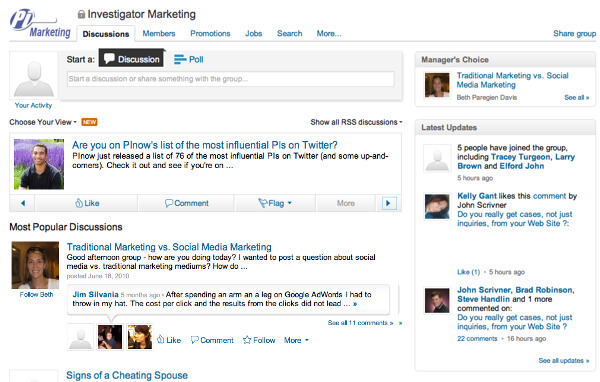 LinkedIn vs. Yahoo: Which Investigator Group Should You Join? There are numerous online communities for investigators to network and collaborate with colleagues, and PInow hosts two major online groups: Investigator Marketing on LinkedIn and Private Investigators PInow on Yahoo. Each group offers a unique community feel with different posting methods, discussion topics, and alerts. So which one is right for you? To help you decide, we've put together a comparison of the two groups. Although the group is rooted in marketing strategies for private investigators, the topics vary substantially. Members often discuss marketing strategies, listings, and the use of social media, but also provide input on current events, technology developments, databases, and networking. Do you really get cases, not just inquiries, from your Web Site? Are you on PInow’s list of the most influential PI’s on Twitter? From RFP (Request for Proposal) notifications and job opportunities to dead phone number searches the Yahoo group is packed with information. The bulk of the posts are requests for assistance for specialty services or for specific areas not covered by the posting investigator. The LinkedIn group consolidates the full day's comments and activity within one email preview. If you start your own discussion, however, you are sent an individual email each time someone comments on your discussion. As opposed to the LinkedIn's summary alerts, Yahoo creates an email thread. Every time an investigator comments on or creates a new discussion, the full message is sent to your email. Yahoo does have the potential to clog your inbox, but this is a default setting. You can edit your membership settings to receive a Daily Digest, Special Notices, or Web Only if individual emails are not your preference. LinkedIn features a modern, graphic-savvy interface, while Yahoo’s display is more text heavy and informative. On LinkedIn, each discussion exists on it own page. In order to see full comments, you must click on the topic from the main page. You can, however, hover over three comments and see the preview of three selected comments. Making a post is simple, as a top banner allows you to type in your discussion or set up your poll and click share. From a usability standpoint, LinkedIn is more interactive than Yahoo, partially because you are required to visit the page in order to view comments and discussions. 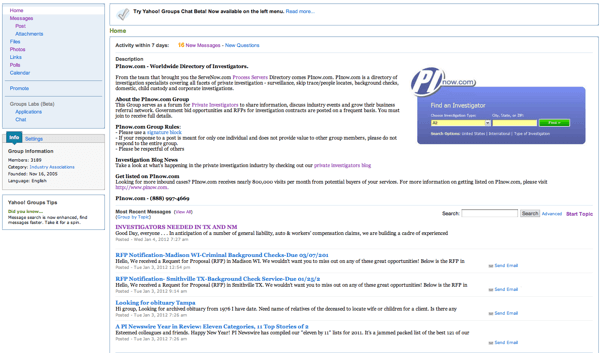 The Yahoo Group home page features a text-centric description of the group and links to recent messages. A sidebar includes links to polls, photos, messages, and post options. Creating a new post is an easy process of clicking post and adding your message in email format. Because default alerts come in individual emails, you can use the reply function to respond to a group message. With this setup you can be a very active member of the group without having to regularly visit the group page. In order to join either group, you must be a professional related to the investigations industry. A moderator must approve membership requests and all posts for both groups. Of course, all posts and membership requests are evaluated on a case-by-case basis. The Yahoo group is more closely monitored than the LinkedIn group, and has strict rules regarding posting methods and content. All posts must be relevant and useful to the industry. The groups moderators require you to include your signature block in your initial post in a conversation, only allow links to original posts, and do not approve posts of a promotional nature, including products and services. The LinkedIn group is moderated less than the Yahoo group, and posts are generally declined if they are negative or the post is objected by another member. Because each community offers a different interface, set of information, and community of members, it is likely in your best interest to join both groups. As LinkedIn focuses on marketing, strategies, products, and current news, you may find it to be the more informative of the two. However, Yahoo provides RFP notifications and job prospects that LinkedIn does not. If you're leaning heavily toward one or the other, consider joining both. Both groups are filled with good-humored professionals, so you may find two communities to share your stories and have a laugh with while getting the most up-to-date industry tips.